Aksel Waldemar Johannessen (1880–1922), Christ and the Blind and Dumb Man (1921-22), oil on canvas, 135 × 102 cm, Private collection. Wikimedia Commons. Aksel Waldemar Johannessen (1880–1922) seems to have sold few paintings during his lifetime, and hardly any – even following his rediscovery – have been bought for public collections. Most were sold after they were found stored in a barn in about 1990, and are now in private hands. Aksel Waldemar Johannessen (1880–1922), Path by the Wood (1916-18), oil on canvas, 90.5 × 76 cm, Private collection. Wikimedia Commons. 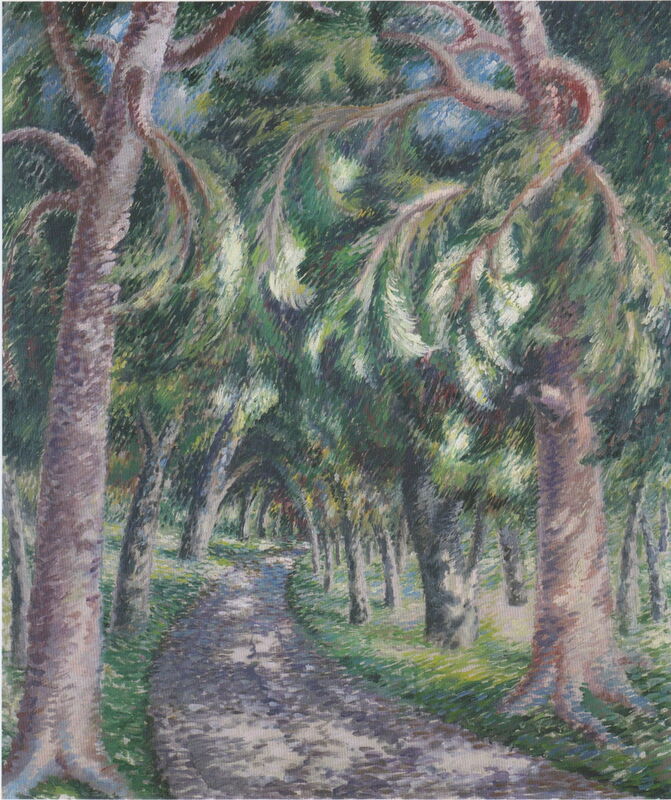 Path by the Wood (1916-18) is one of two or more of Johannessen’s paintings which show the forest at Nesodden, a promontory on the opposite bank of Oslo Fjord from Asker, where the artist and his family rented a house for the summer. The woods here were owned by Johannessen’s patron Karl Granerud, who was later to be guardian of Johannessen’s work and children, following his death. Aksel Waldemar Johannessen (1880–1922), Ploughing in the Spring (1916-18), oil on canvas, 76 × 90 cm, Private collection. Wikimedia Commons. 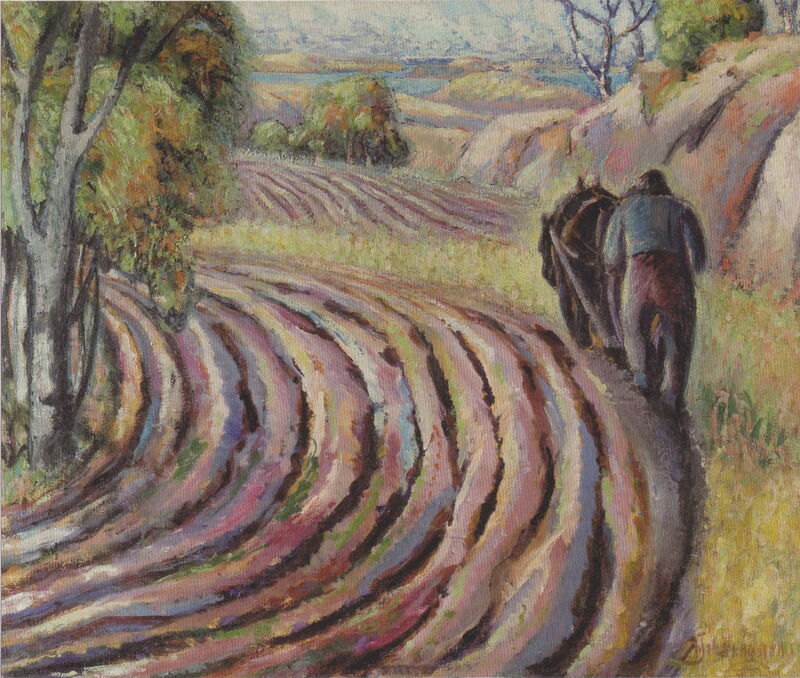 During the later years of the First World War, Johannessen turned to rural scenes more, such as this of Ploughing in the Spring (1916-18). A single farmer with a plough hooked up to a single horse would have been typical of the small scale of many of the farms at the time. Aksel Waldemar Johannessen (1880–1922), Peasant with Cabbages (or Cauliflowers) (1918), oil on canvas, 180 × 120 cm, Private collection. Wikimedia Commons. 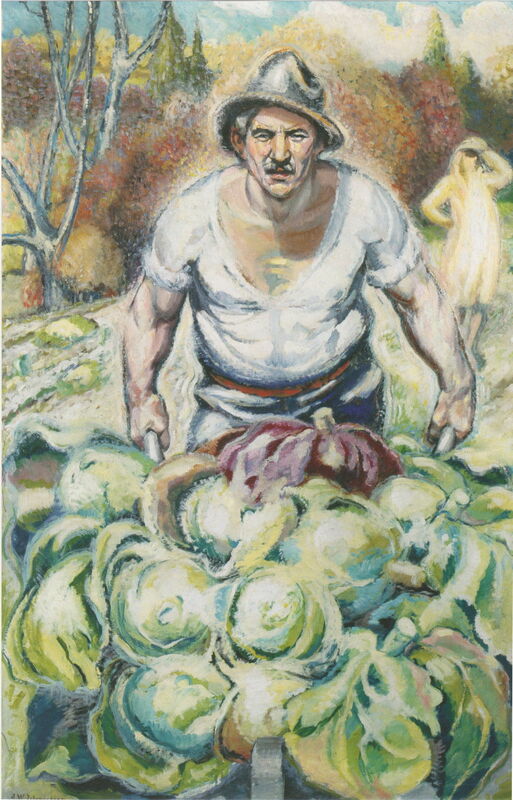 Peasant with Cabbages, also known as Peasant with Cauliflowers, from 1918, shows a farmer with a wheelbarrow full of either cabbages or cauliflowers. His face is closely observed, and magnificent in its detail. Behind and to the right of him, though, is what appears to be a well-dressed young woman, who doesn’t look entirely human. 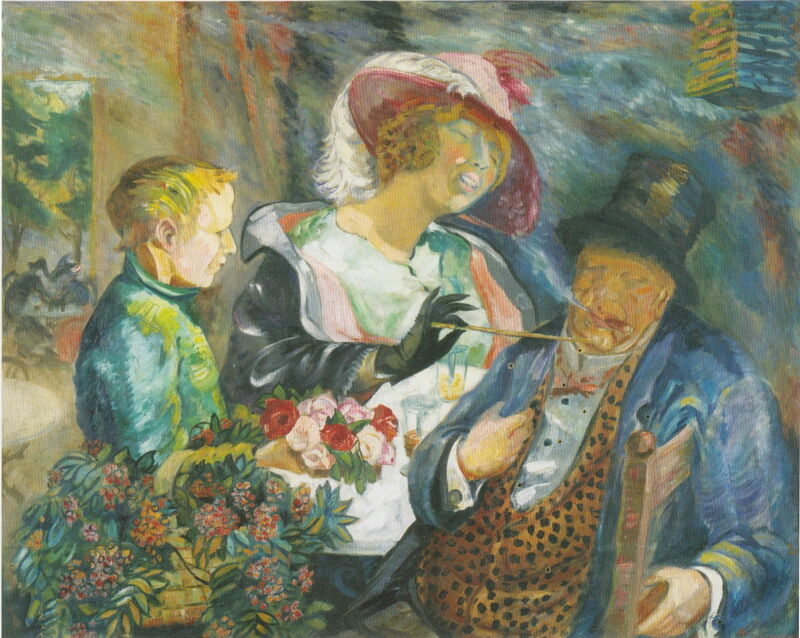 Aksel Waldemar Johannessen (1880–1922), After the Performance (1918), oil on canvas, 118 × 148 cm, Private collection. Wikimedia Commons. The Johannessens remained heavily involved in the theatre. After the Performance (1918) shows an actor from their favourite Det Norske Teatret being congratulated following a production. Aksel Waldemar Johannessen (1880–1922), Mother and Child (1918-20), oil on canvas, 190 × 97 cm, Private collection. Wikimedia Commons. By the end of the war, Johannessen was struggling with worsening bouts of heavy drinking, and this took its toll on his family. He returned to paint more social themes, some again in remorse at his alcoholism. 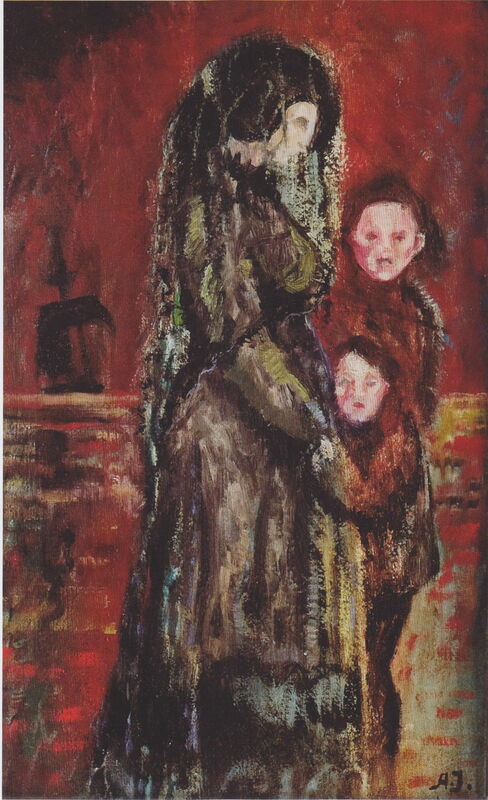 Mother and Child (1918-20) is set in the Hammersborg district of Oslo in which Johannessen had been brought up, and where he and his wife first set up home together. 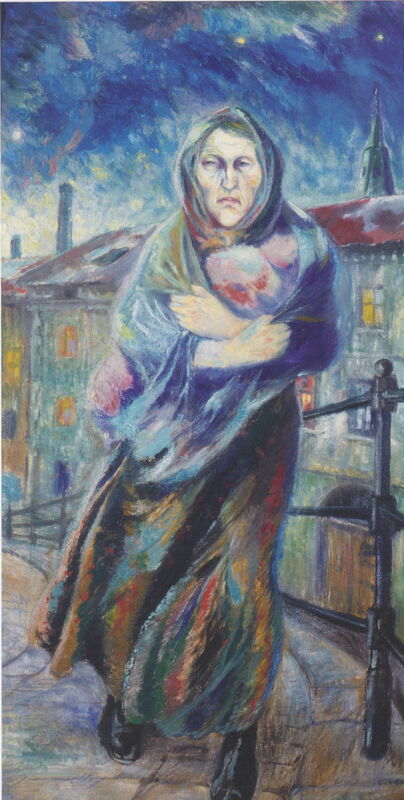 A care-worn working class mother is seen walking out at night, her young child held firmly within her shawl. Aksel Waldemar Johannessen (1880–1922), Streetboy (1918-22), oil on canvas, 107 × 114.5 cm, Private collection. Wikimedia Commons. 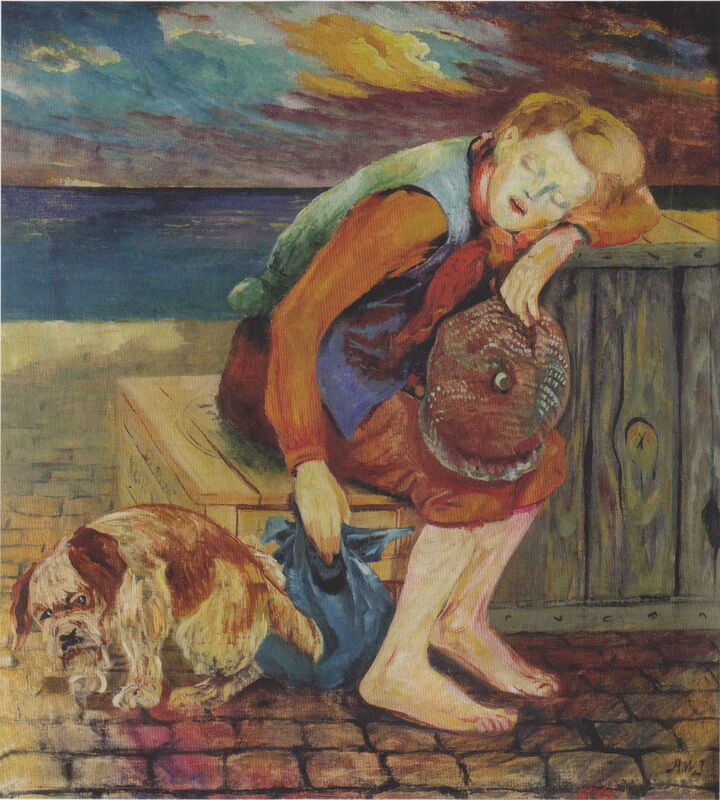 Streetboy from 1918-22 shows a homeless boy asleep on some packing cases in the docks, his small dog looking equally hard done by, beside him. Johannessen also painted several religious works. 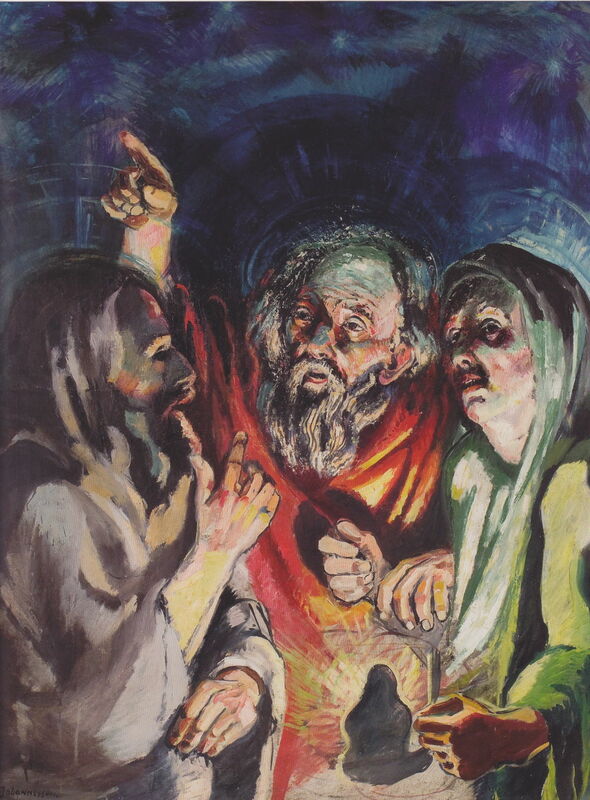 My favourite among them is Christ and the Blind and Dumb Man (1921-22), with its powerful effect of the light thrown up at the figures and their faces. Aksel Waldemar Johannessen (1880–1922), Adam and Eve (date not known), oil on cardboard, 178 x 118 cm, Private collection. The Athenaeum. 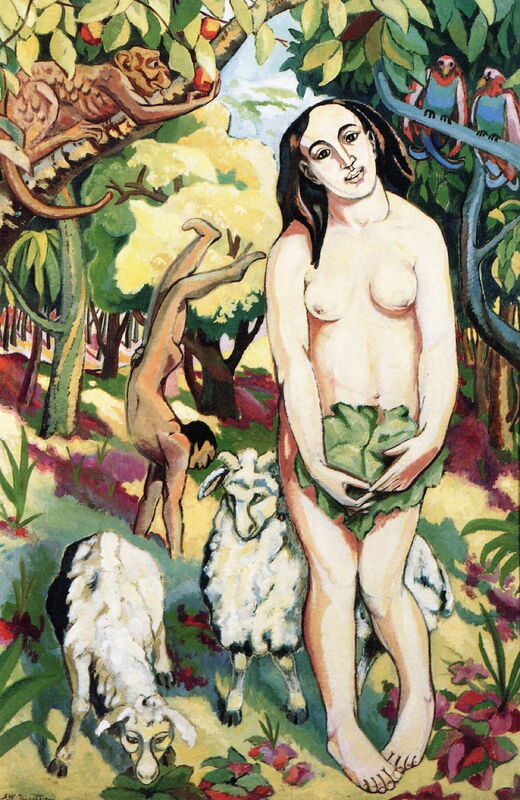 This undated Adam and Eve is probably from earlier and happier times, showing the couple in a colourful paradise, with a pair of sheep grazing peacefully by them. In 1921, Anna Johannessen was diagnosed with cancer. Aksel Waldemar Johannessen (1880–1922), Without Peace (1921-22), oil on canvas, 285 × 205 cm, Private collection. Wikimedia Commons. Without Peace (1921-22) is recognised as being Johannessen’s late masterwork, telling his life story in multiplex narrative. That is to say that it shows several scenes from different moments in his life, past and future, in its single image. Johannessen is at the centre, cradling the body of his dead wife on his thighs. 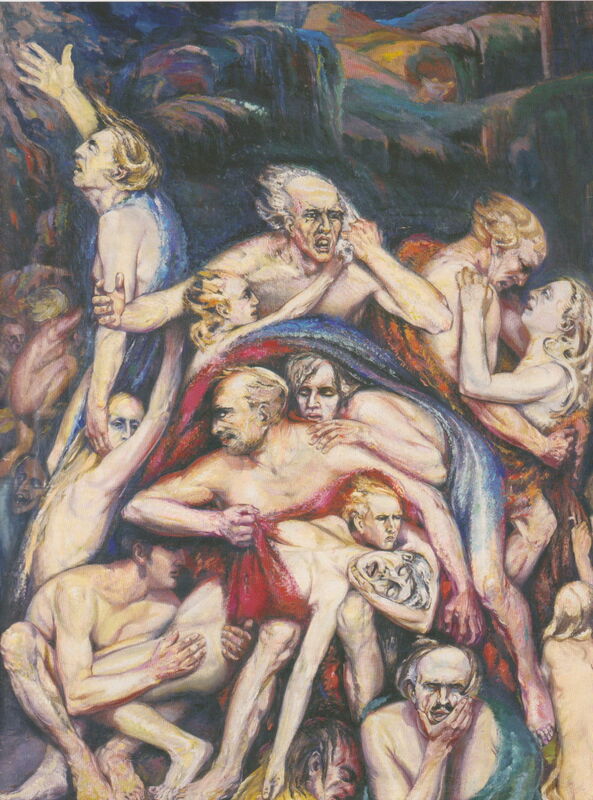 Above are three separate self-portraits of him enduring crises, and other figures from his past crowd much of the rest of the large canvas. Aksel Waldemar Johannessen (1880–1922), The Artist’s Daughter Aasa at the Window (1922), oil on canvas, 89 × 75 cm, Private collection. Wikimedia Commons. 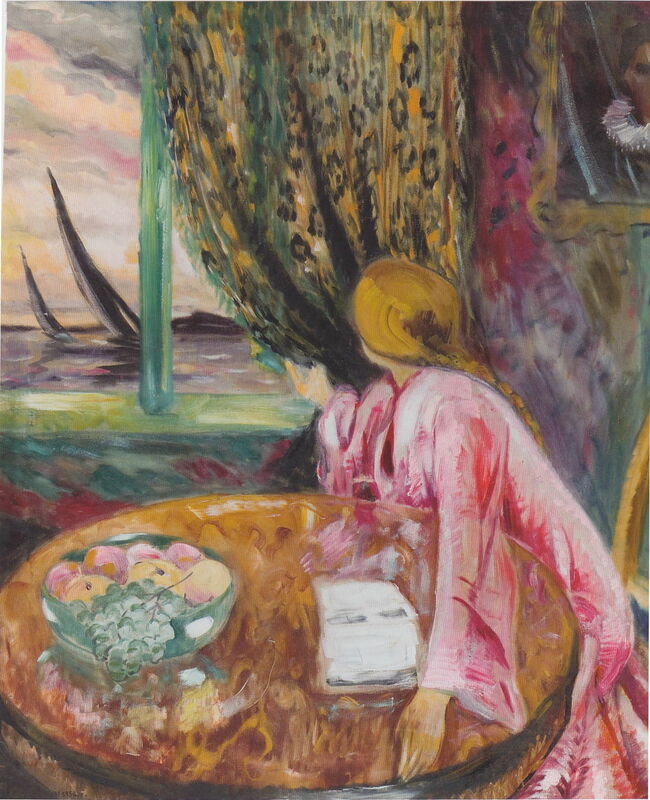 The Artist’s Daughter Aasa at the Window (1922) is similarly loaded with symbols of death: the black sails on the yachts, and an image of a Nordic church minister at the upper right, as the Johannessens’ daughter Aasa looks wistfully through the window. Aksel Waldemar Johannessen (1880–1922), Girl Putting on her Shoes (1922), oil on canvas, 120 × 100 cm, Private collection. Wikimedia Commons. 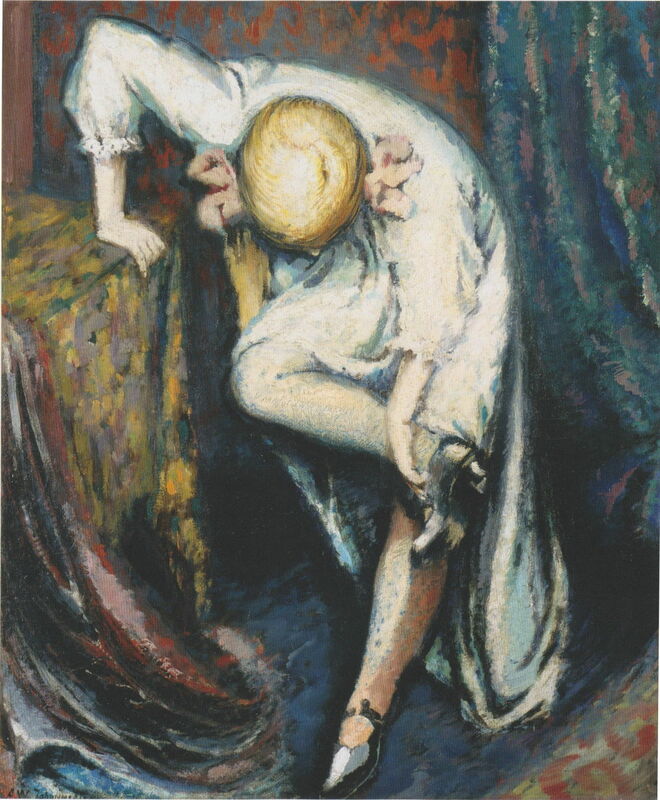 Girl Putting on her Shoes (1922) also shows daughter Aasa, who in these later paintings was Johannessen’s favourite model. Aksel Waldemar Johannessen (1880–1922), Mourning (1922), oil on canvas, 44 × 27 cm, Private collection. Wikimedia Commons. Finally, he states his greatest fear and premonition, that he should die before Anna, in Mourning (1922). His wife and daughters are here left as he sails in the black ship seen on the left horizon. Strangely, that is exactly what happened. In the autumn of 1922, with Anna’s cancer bringing her life to a premature end, Aksel Johannessen rapidly developed pneumonia, and died from that on 25 October 1922, the day before his 42nd birthday, in Oslo. Anna survived him by only four months, which at least gave her time to ensure that their two daughters were properly provided for. She was only a year older than him. Aksel Johannessen’s artistic legacy was left in the hands of the artist Ola Abrahamsson. He arranged for a retrospective exhibition to be held at Blomqvist’s gallery in Oslo, the best. His collection of paintings attracted high praise from critics like Jappe Nilssen, who had recognised Munch’s talent, and Edvard Munch himself. Then everything went wrong. The paintings from that exhibition, indeed almost the entire life’s work of Aksel Johannessen, were put into storage in a barn. It wasn’t until 1990 that they were rediscovered. Since then they have been shown across Norway and as far afield as Italy, and have started to achieve the recognition that they deserve. At last. Haakon Mehren’s website with details of books and more. Posted in General, Life, Painting and tagged Johannessen, Krohg, Munch, Norway, painting. Bookmark the permalink. Thank you for your very generous words. I’m delighted that you enjoyed it.